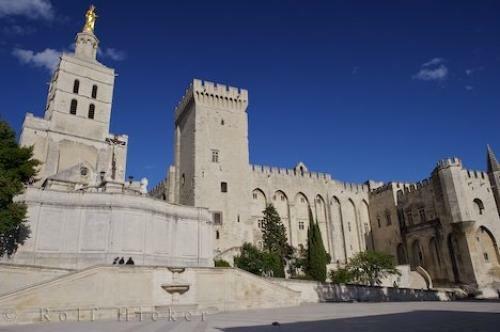 The ancient Palace of the Popes, Palais des Papes, on the Place du Palais in Avignon, Provence in France, Europe. in Avignon, Provence in France, Europe. ... as one would find in other palaces but the frescoes, panelling and atmosphere are reasons enough to visit the Palace of the Popes in Avignon, France.Palais des Papas along Place du Palais in the medieval walled city of Avignon, Vaucluse, Provence, France, Europe. I photographed this photo with the digital SLR camera model Canon EOS-1Ds Mark II, aperture of f/8.0, exposure time of 1/200 sec. on ISO 100, as always I used a original Canon Lens, the focus lenght for this picture was 25mm.